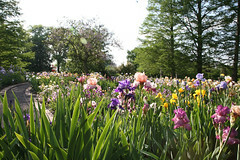 The sweeping Alice Hahn Goodman Iris Garden, designed in 1984, contains over 1,500 irises, including every horticultural division of bearded iris, beardless Siberian and Louisiana irises, and a collection of species irises adaptable to the St. Louis climate. Every spring the Iris garden explodes in a rainbow of colors. Bearded irises, referring to the fuzzy appendage found on the lower petals, are the earliest to bloom in the collection; with the smallest of the bearded blooming first in late April. The bearded iris continue throughout May with the peak for the St. Louis area considered to be Mother’s day. After the bearded the beardless iris begin their show blooming into early June. The Iris collection also has a small group of rebloomers that both bloom in the spring and again in the fall. Our collection also includes a complete collection of Dykes Medal winners, which is the highest award given to an Iris by the American Iris Society. The collection houses many species Iris some native to Missouri others from all over the world. Irises are great plants to grow here in St. Louis as they thrive in our climate. They are also the symbol of our city, the fleur de lis is a stylized rendering of an iris flower. The Iris collection here at the Missouri Botanical Garden has been around for over a 100 years. Before the collection found its current location it was housed in several different areas around the Garden. The American Iris Society even once was housed here at the Missouri Botanical Garden. The Iris Garden is a sanctioned American Iris Society Display Garden and a sanctioned Historic Iris Preservation Society Display Garden. The collections are largely overseen by the local Greater Saint Louis Iris Society. The bronze sculpture Unicorn Spirit is on the east side of the main path, across from the Iris Garden.